You’ve decided to try yoga for the first time? You’ll find that the benefits of yoga go far beyond the physical health and fitness. Yoga will bring peace and clarity to your life and will encourage love and acceptance for yourself and your body. How are you feeling about your first yoga class? Excited? Nervous? Doubtful? Not sure what to expect? All these feelings are completely normal when you’re starting something new. Hopefully, this post will help you walk into your first yoga class feeling ready to dive into it. You don’t need to follow the latest yoga fashion to practice yoga. Wear something comfortable and light. You’ll be doing a lot of twisting and stretching; choose clothes that won’t restrict your range of movement. There’ll also be some upside-down poses, so don’t wear loose T-shirts that may slide up and cover your face or reveal more of your body than you’re comfortable with. Fitted tops and leggings are a great choice. Our studio is heated in winter, but you may still want to have some warmer layers for the still poses. Bare feet provide the best grip and stability for yoga. You’ll be leaving your yoga shoes at the door of the studio. 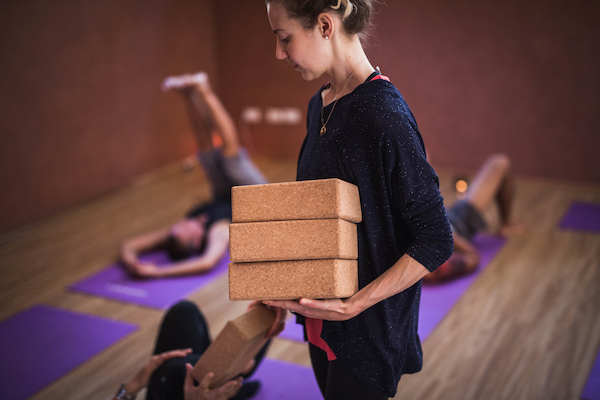 We provide yoga mats, bolsters, blocks and even cushions and blankets to keep your comfortable and warm. All you need to bring is yourself and your bottle of water. You may be worried that you don’t know what you’re doing, you’re not flexible enough and everyone else is so much further ahead than you are. None of this is true. Anyone can do yoga. You can, too. Yoga is a journey back to yourself. It is about accepting who you are and listening to your body. It doesn’t matter what anyone else in the class is doing, you get to choose what is right for you. If you can’t reach your toes or do a headstand, it doesn’t make you a bad person… or a bad yogi. Simply choose a variation that works for you your teacher will offer plenty of those. Tell your teacher it’s your first class so that they can help you execute the poses safely and suggest modifications for your whenever necessary. Doing something for the first time is nothing to be embarrassed about. Every single person in the class, including the teacher, has been where you’re standing right now. It may have been only recently that they came to their first class or it may have been years ago, but everyone still remembers what it is like to be new, The other students will completely understand your feelings and will support you with their accepting presence. We offer flow, slow flow and restorative yin yoga classes in the Blue Mountains. Choose one of these styles or try all of them.